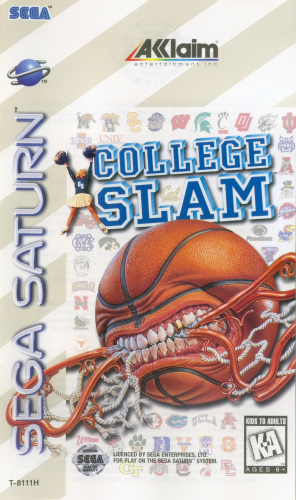 COLLEGE SLAM brings fast-paced, rim-rattling basketball action to the Sega Saturn. Choose from 40 top college teams and play the semifinal, tournament, or 20-game season mode. All of the power-ups and gravity defying, backboard-busting dunks you expect from COLLEGE SLAM are here. When a player hits three shots in a row, he continues to light up the scoreboard while on fire. To make the game feel like college, the Cincinnati Bearcat Band performs each school's fight song. With all of the action in COLLEGE SLAM, you'll wish that you had stayed in college for a fifth year.